SCR2 N-10 Titan Tankless Water Heater Discounts Apply ! Low power model, 110/120V system. Ideal for a small sink, lavatory, or a wet bar where only warm water will be needed. This unit will not produce hot water for showering applications. 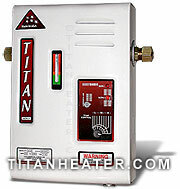 The Titan SCR2 N-10 continually heats water instantaneously as you require it - and only when you require it.